Pictured are some of the individuals who volunteer with the Kids on the Block of Central Ohio program. Ronald Reagan made a proclamation in 1983 that made the month of April the “National Child Abuse Prevention Month.” The threat and realities of child abuse reach all corners of the world, and while more is being done today than ever before to combat the epidemic, the sobering reality remains that even one child is one too many. Equally as crippling as the abuse itself is the inability for the victims to seek help; to rise above their somber circumstances. 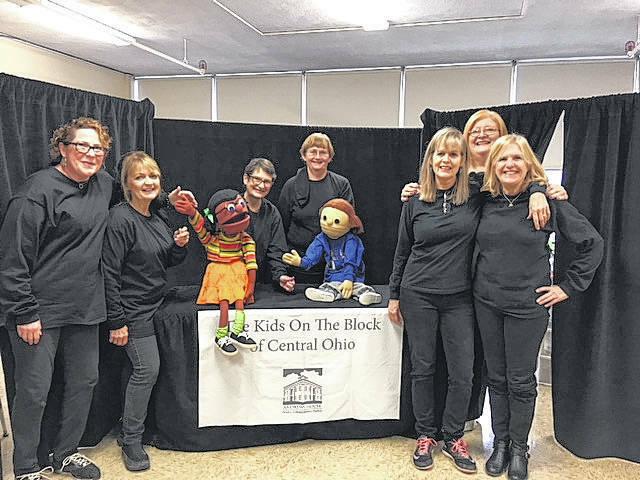 The Central Ohio chapter of the Kids on the Block program is dedicated to educating children on how to recognize, resist, and report any type of abuse they may experience. Kids on the Block began in 1977 with a goal of helping disabled children integrate into public school systems. Since then, it has evolved to doing puppet shows that include a wide range of social, educational, and medical issues children may face. The Central Ohio chapter is one of more than 1,000 troupes that are active, not only in the United States, but spanning the globe. The shows feature bunraku, a Japanese form of puppetry that began in the 17th century. The puppeteers, dressed in black from head to toe, tend to fade into the background behind the puppets. Shows are geared towards elementary students, with Lehr’s program typically focusing on students in grades 1-3. After volunteering since 2008, Lehr jumped at the opportunity to lead the program in 2015. The encouragement of children to speak up is among the most important messages Kids on the Block delivers to the students. The continued rise of social media and the subsequent evolution of the cyberbully and child predator has also forced Lehr to add to her programs. “What we’re trying to do now is revise our skits to talk more about cyberbullying so these younger kids understand what they can do with a cell phone and how they can hurt another person,” she said. “It’s changed (the program) immensely. With Kids on the Block being nonprofit, shows are entirely free to schools. Lehr is the only employee, with all other contributors doing so purely on a volunteer basis. The program relies on donations and foundation support, and the need for additional support is always pressing. Lehr received a $4,000 grant from William Street United Methodist Church (Delaware) in 2016 and a $1,000 grant from the Delaware Country Foundation in December of last year. She hopes there will be more help coming in the near future. Equally as pressing as the need for funding is the need for more volunteers. Lehr said all current volunteers are now retired and are former school teachers and counselors that saw the Kids on the Block program in their schools. With the shows only being done during the school year, and periodically throughout a given week during that school year, the time demand is manageable, as Lehr explained. Despite the always-present need for more resources, Lehr remains dedicated to continuing to serve Central Ohio’s youth. As she stated, “If someone calls me, I don’t turn them down.” The troupe has done shows as far away as West Jefferson and Milford Center. Donations can be made through the Andrews House (with a Kids on the Block designation) or the Kids on the Block of Central Ohio website. Anyone interested in volunteering or booking a show can also visit the website and Facebook page, or contact Lehr at 740-602-0481.